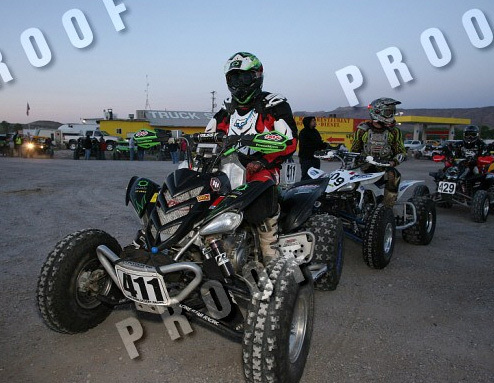 When I joined Big Bang Desert racing in 2010 I didn't know how hard it would be to add additional fuel capacity to the team's race quad, a 2008 Yamaha Raptor 700 EFI. 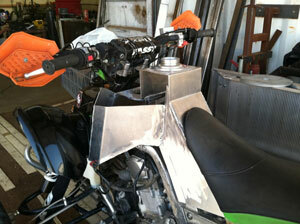 Neither Clarke or IMS make an oversize tank for them due to the EFI and the plastics. 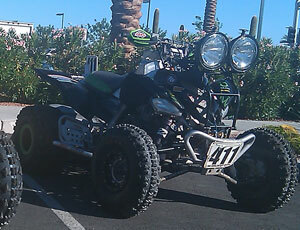 This has kept many teams from using the Raptor 700 in desert racing. I know they use it in Dakar but they run enormous fuel systems that are overkill for what we need. I found some threads on a few Raptor boards of a guy making aluminum tanks but he disappeared with a lot of people's money. I know plenty of fabricators but we didn't have the coin to get a custom tank made. We timed our pit stops and they were horribly slow. The problem is the stock Raptor tank is only 2.9 gallons and when you make a lot of horsepower which is easy to do with a Raptor it means you only get about a 50-55 mile range at race speeds. Also the stock tank is black and it is pretty well tucked under the handlebars making it impossible to use a quick fill. 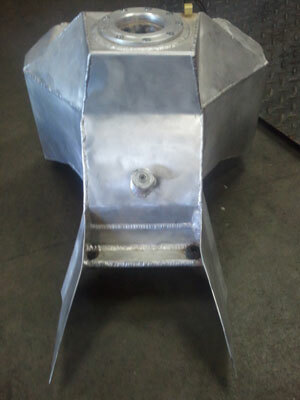 So, after wasiting valuable time at each pit stop in 2010 we finally had a custom fuel tank made by Metal Tech in Phoenix Arizona. 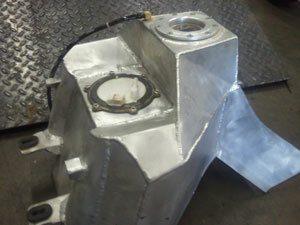 The tank was designed by Kelly at KMS to utilitize the stock fuel pump and hanger system. He also devised a new pump pickup and filter system. Most importantly the tank uses the stock mounting points and stock rubber mounts and spacers this is to prevent the tank from cracking. Admittedly the tank looks absurd but I am sure it would blend in more if it were painted or powdercoated. The tank is 5.25 gallons only 5 of which is useable. This gives us nearly a 100 mile range at race speeds. We first used the tank at the 2011 Silver State 300. We finished 3rd but we had problems all day with the engine feeling down on power. It turned out the in tank fuel filter was clogged, causing fuel delivery problems. Kelly added a different filter system and it worked fine in testing. 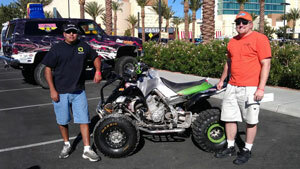 So we used the tank again at the 554 mile 2011 Vegas to Reno race with hopes of cutting an hour of our time. We started off strong but we ran into the same problem with the power cutting out, eventually the engine went into limp mode, due to running lean. The fuel filter was comletely clogged this time. We believe this problem can be solved with a different filter and by cleaning the tank out differently. So far we have two hard races on this tank and lots of pre running and it has zero cracks in it. Many people look at it and ask if it hurts your knees. 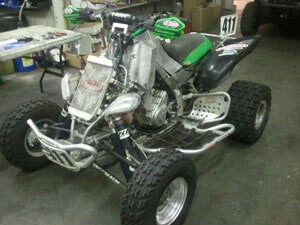 I have logged over 300 race miles on it and it doesn't hurt or feel any different than a stock tank and plastics. 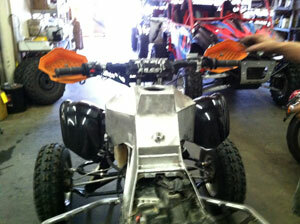 Update 9-17-2014: If you'd like to purchase your own Raptor gas tank please visit the WARP Off Road Website here. Update 9-7-2012: I wanted to update everyone now that we have many more hours on the Raptor. I can officially say that fuel tank and KMS fuel system are 100% proven. We have a lot of testing and race hours on this setup and we haven't had a single issue with it. We did have issues with the fuel filter clogging and then overheating the pump when the pump was inside the custom tank, but now that everything is external we have had zero issues. For a non racer I think the in tank system is fine with the KMS revised oversize fuel filter sock. Also everyone said the aluminum tank would never with stand the abuse of racing, so far we have had zero issues with it and we have well over 1000 race miles on it. 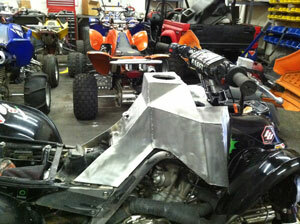 If you want an oversized Yamaha Raptor fuel tank call Tyler at Metal Tech and he will make one like ours for you. Tyler: 623-915-9856. Tell him KMS or Trent sent you. It bolts on with all the factory grommets and hardware. You will have to cut up your front plastics. Tyler at Metal Tech also fabricated our 100% custom chrome moly center frame. The OEM frame was too cracked and worn out so Tyler made a custom one from scratch. It is pretty awesome.